The Ouachita Mountains and Ouachita National Forest span the state line between Arkansas and Oklahoma, and in fact some individual trails do too so it seems easiest to segregate these from the state-specific pages. Bluebell Country Store & Cafe, NE corner of AR-298 & AR-27, Story Ark, (870)867-3999. You leave your vehicle at their store, they transport you to the trail head. On the agreed day they drop your vehicle at your destination. About $1/mile. They seem willing to cover at least the area between AR 9 and Big Brushy Rec Area, maybe more. Especially useful for hikers of Ouachita, Womble, and maybe Lake Ouachita Vista trails. Athens-Big Fork Trail. 10.1 miles point-to-point. Located SE of Mena Ark. USFS map. Considered very challenging due to the elevation changes – you’re going across 8 ridges. Several creek & river crossings (potentially hazardous after big rains). Very scenic. Most of this trail forms the western leg of the Eagle Rock Loop (also see below). The north trail head is approximately 34.450779, -93.969568. The south trail head is approximately 34.347174, -93.98453. There are other trail heads in between on FR 25 (34.434211, -93.973845) and FR 106 (34.381731,-93.96242). Jan ’14 ERL trip. Beaver’s Bend State Park. <<to do>> May ’14 trip. Beech Creek National Scenic and Botanical Area. 33 miles of trails near Big Cedar, OK (just south of Rich Mtn). Trail head is about 34.596405, -94.499620. OuachitaMaps.com topo map. Big Brushy Trail Complex. Located a bit NE of Oden. USFS info. The Big Brushy Recreation Area parking lot is at 34.68513489, -93.81024933. No camping in the rec area, it is day use only now (despite USFS web page). The Ouachita trail passes through here, and this is one of the major trail heads at mile 94.5. There’s another OT trail head west on FR 76 at mile 87.7. In addition to the OT, there are 4 short trails that can be used to create various loop hikes (or bike rides). 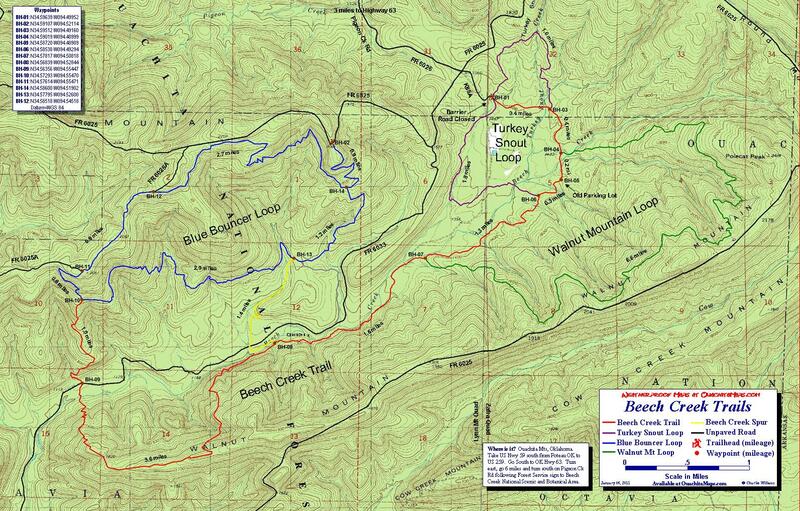 See Ouachita Trail map #13. Brushy Creek Trail, 3.66 mi. Brushy Mountain Trail, 1.23 mi. Rockhouse Trail, 1.76 mi. Mountain Top Trail, 1.11 mi. Jan ’16 trip. Billy Creek Loop. 7 or 11-mile loops on the south side of Winding Stair Mtn. Uses the Ouachita Trail for part of the bigger loop. Intersects and can be combined with the Horse Thief Spring Trail for a longer hike. Trail head is at about 34.689468, -94.733558 in the Billy Creek Rec Area or at 34.736916, -94.726246 in the Horse Thief Spring area on OK Hwy 1. OuachitaMaps.com topo map. Apr ’14 trip. Black Fork Mountain Trail. 11.6 miles out-and-back. Located mostly in the Black Fork Mountain Wilderness NW of Mena Ark. Black Fork Mountain runs parallel to and on the north side of Rich Mountain with US-270 between. Trail head is at 34.684510, -94.317724. Part of the route is shared with the Ouachita Trail. See Ouachita Trail map #8. Nice views at the top. Sep ’13 trip. Jan ’16 trip. Boardstand-Old Military Road Loop. A 22-mile loop on Winding Stair Mountain consisting of the Boardstand and Old Military trails, along with part of the Ouachita trail. One trail head is in Talimena State Park, another is off Holson Valley Rd at about 34.821501, -94.886184. OuachitaMaps.com topo map. Jan ’12 trip. Buckeye Trail. 4.3 mile point-to-point. One end point is in the middle of the Caney Creek Trail (see below). You can make a 9.5 mile loop consisting of the Buckeye trail, the eastern part of the Caney Creek trail, and a 1-mile road walk between trail heads. OuachitaMaps.com topo map. Trail head coordinates: Buckeye is 34.40879, -94.02805, Caney Creek (east) is 34.396828,-94.022513. May ’14 trip. Caney Creek Trail. 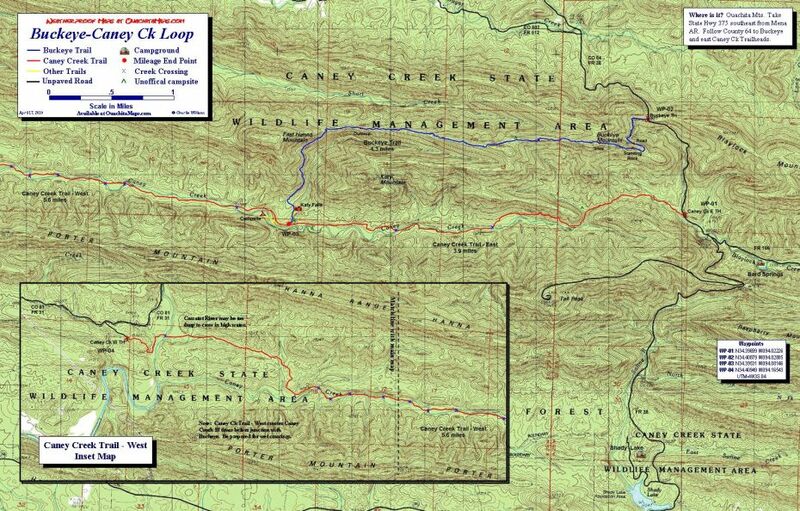 9.5 mile point-to-point traversing the length of the Caney Creek Wilderness. 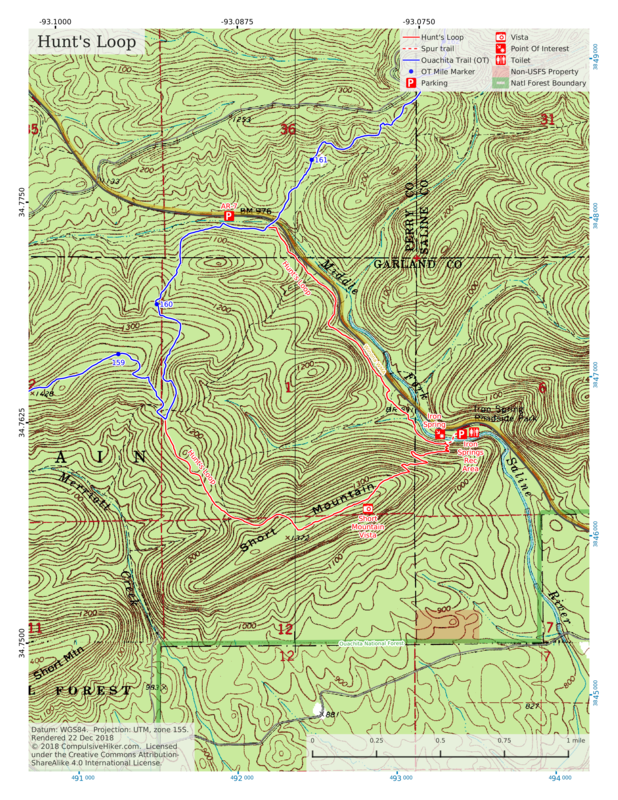 OuachitaMaps.com topo map. Many crossings of Caney Creek and one crossing of the Cossatot River. Trail head coordinates: east end is 34.396828, -94.022513, west end is 34.409654, -94.165386. Cossatot River Corridor Trail. 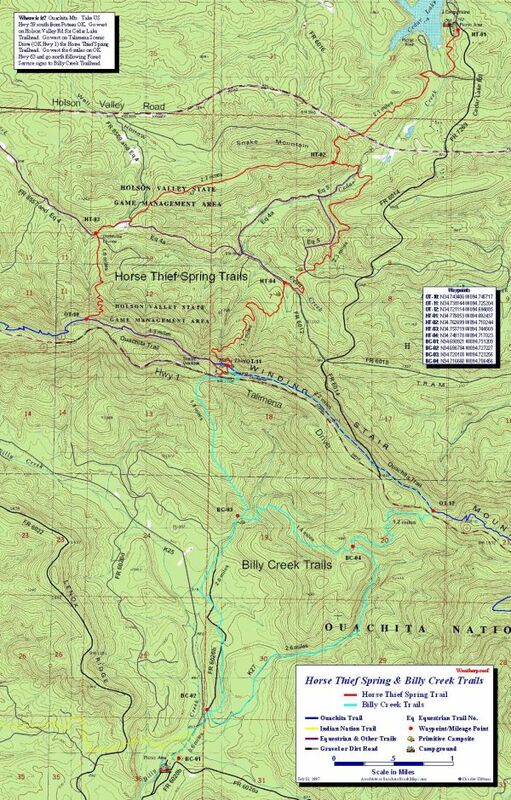 12.5 mile point-to-point located SE of Mena Ark in Cossatot River State Park & Natural Area. The trail runs parallel to the river and crosses it twice though there are few high scenic vistas and sometimes you don’t even see the river for long stretches, especially in the south third. OuachitaMaps.com topo map. Primitive camping isn’t allowed but there are campgrounds ($) at 4 of the 5 trail heads: south end (Visitor Center) is 34.295853, -94.176023, Cossatot Falls is 34.321051, -94.227517, Sandbar Bridge is 34.322234, -94.235817, and Ed Banks Bridge is 34.340001, -94.251161. The north trail head (no camping) is at 34.379099, -94.237385, on the south side of AR 246 across the road from a parking area. Ed Banks Bridge is closed to vehicle traffic but is one of the places where the trail crosses the river and it can be hazardous in high water. The other crossing is at the south end on an old road bridge. May ’14 trip. Cove Lake Loop. 2.9 or 3.5 miles, depending on whether you take the longer route via Lookout Window. Goes around the lake in the Cove Lake Recreation Area a couple miles north of Mt Magazine. Main parking area and trail head is at 35.233088, -93.62874. The other end is at the boat ramp (about 35.227517, -93.625316) with a 0.4 mile road-walk in between. OuachitaMaps.com topo map. Sep ’14 trip. Eagle Rock Loop. 27-mile loop located SE of Mena Ark. Consists of parts of the Little Missouri, Viles Branch, and Athens-Big Fork trails. OuachitaMaps.com topo map. There are 9 crossings of the Little Missouri River and 12 creek crossings so this can be a no-go after big rains. Trail head coordinates: Upper Little Missouri is 34.434164, -93.973661, Little Missouri Falls is 34.422682, -93.919546, Albert Pike is about 34.37536, -93.87800, Winding Stair is about 34.366093, -93.902081, West Blaylock Creek is about 34.38172, -93.96234. Jan ’14 trip. Fourche Mountain Trail. A network of trails, perhaps used primarily by ATVs and equestrians. Located about 5 miles east of Y City Ark. Parking and trail head are at about 34.726626, -93.990554. Some trails cross or parallel the Ouachita Trail. USFS map. Hole In The Ground Mountain Trail. 7.3 miles out-and-back. The western trail head is southeast of Booneville Ark in the Jack Creek Recreation Area at about 35.033558, -93.845859. This is also one of the trail heads for the Sugar Creek trail. The eastern end is on Dry Creek Road at about 35.03383, -93.795924 right across from the Dry Creek Wilderness. There’s no designated parking area there. Last day of this Sep ’13 post. Horse Thief Spring Trail. 8.5 or 12.5-mile loops on the north side of Winding Stair Mtn. Uses the Ouachita Trail for part of the loop. Intersects and can be combined with the Billy Creek Loop for a longer hike. Trail head is at 34.736916, -94.726246 in the Horse Thief Spring area on OK Hwy 1, or about 34.779912, -94.692783 in the Cedar Lake Rec Area. OuachitaMaps.com topo map. April ’14 trip. Huckleberry Mountain Trail System. 35+ miles of multi-use trail stretching from Mt Magazine east to Huckleberry Mountain. It’s often called a horse trail but I suspect once ATVs were allowed in, the equestrians went elsewhere. One trail head is at the horse camp on Mt Magazine. I’m still researching this but it appears the “trails” are really just roads – many of which are still open to normal vehicle traffic – so this might not be of much interest to a hiker. Hunt’s Loop. A 4.3-mile loop north of Jessieville, Ark on the west side of AR 7. 1.2 miles shared with Ouachita Trail. Iron Springs trail head at about 34.76275, -93.07448. Ouachita Trail highway 7 trail head is 34.77424, -93.08833. My map is 1:18000 scale on 8.5×11 paper. Nov ’14 trip. Lake Sylvia Loop. 4.1 mile loop located south of Perryville, Ark near the Lake Sylvia Recreation Area. The entrance to the rec area is at 34.86375, -92.81898 with the trail head being about 100′ beyond. There’s off-road parking for at least a dozen cars. See Ouachita Trail map #25. Sep ’14 trip. Feb ’16 trip. Caddo Bend Loop. 4-mile loop in the state park beginning just a bit west of the visitor center. A tornado in 2011 left much of the trail without a forest canopy. Trail head is at 34.61762,-93.17871. Nov ’14 trip. Little Blakely Loops details and map. Possum Kingdom Trails. USFS info. These trails are mostly on roads and would appeal primarily to bicyclists, I think. Vista Trail (aka LOViT). 40-miles. Official info and maps. USFS info. Runs along the south side of the lake from the dam to Denby Bay. Mount Magazine State Park. Located SE of Paris Ark, this is the highest point in Arkansas at 2753′. There are several trails around the rim near the top of the mountain: Mossback Ridge, North Rim, Bear Hollow, Will’s Apple Road, Highpoint, Benefield. There are various connectors that can join these for different hike lengths. May ’13 sightseeing, Aug ’14 hike. Dripping Spring Trail begins at the Brown’s Spring Picnic Area and goes west along the north rim for about 2 miles where it intersects Tower Road (FR 1606). You can continue west on the road about 0.5 miles to the west rim. This is now officially a fire-break rather than a trail so it’s not described in any of the park’s current trail literature but the visitor center has an old write-up available. Sep ’14 trip. 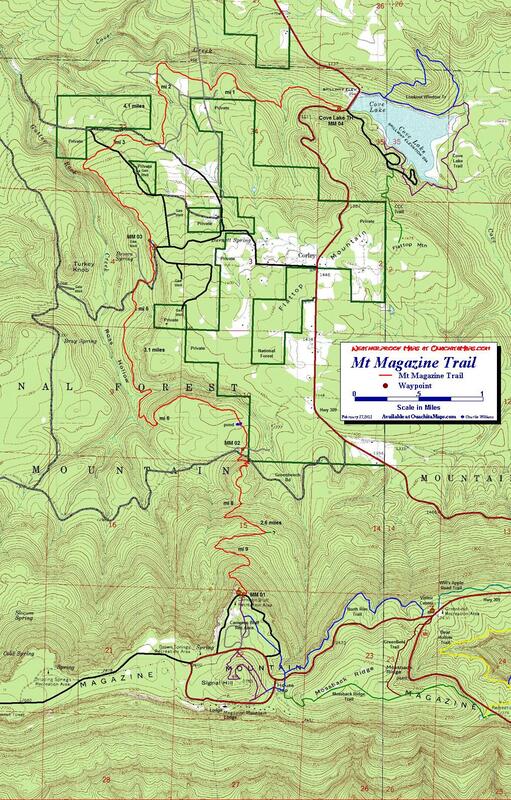 The Mt Magazine Trail runs about 10 miles between Cove Lake and Cameron Bluff Overlook Drive atop Mt Magazine and connects to all the other trails there. Primitive camping is allowed along the trail except the very short segment within the state park but there is a lot of private property scattered along the route so watch out for that. OuachitaMaps.com topo map. Mount Nebo State Park details and trail map. Ouachita Trail details and maps. Petit Jean State Park details and maps. Pinnacle Mountain State Park. <<to do>> Nov ’14 trip. Poteau Mountain Wilderness. <<to do>> Oct ’13 trip. Robber’s Cave State Park. <<to do>> OuachitaMaps.com topo map. Sep ’13 trip. Tall Peak Trail. 6.4 miles out-and-back. Begins in the Shady Lake Recreation Area and goes NW, climbing about 1200′ to the top of Tall Peak where there is a radio tower and an old fire watch tower. The area is in the lower left of this OuachitaMaps.com map, though the trail is not marked on it. Trail head is near 34.368045,-94.031853. May ’14 trip. This area also has the Shady Lake Trail, a 3.2 mile loop around the lake and surrounding woods. I haven’t hiked it, but the area below the dam appears to have some nice scenery. Wildcat Mountain Trails details and map. Womble Trail details and maps.